2 Girls Who Travel love to follow Houston’s burgeoning food scene. (We’re really foodies at heart.) Houston is also home to several James Beard Award winners, including 2014 James Beard Award-winning chef, Chris Shepherd. 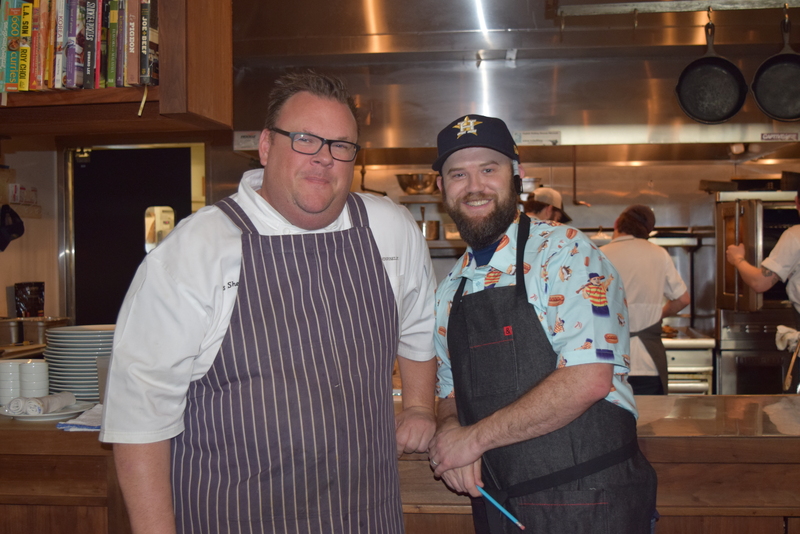 Shepherd, with his business partner Kevin Floyd, leads Underbelly Hospitality. Recently Shepherd closed his über-popular restaurant Underbelly and is now preparing to open UB Preserv (slated to open May 2018) with a more global, limitless take on cuisine. Also opening in late 2018 is Georgia James, based on the successful One Fifth steakhouse concept. 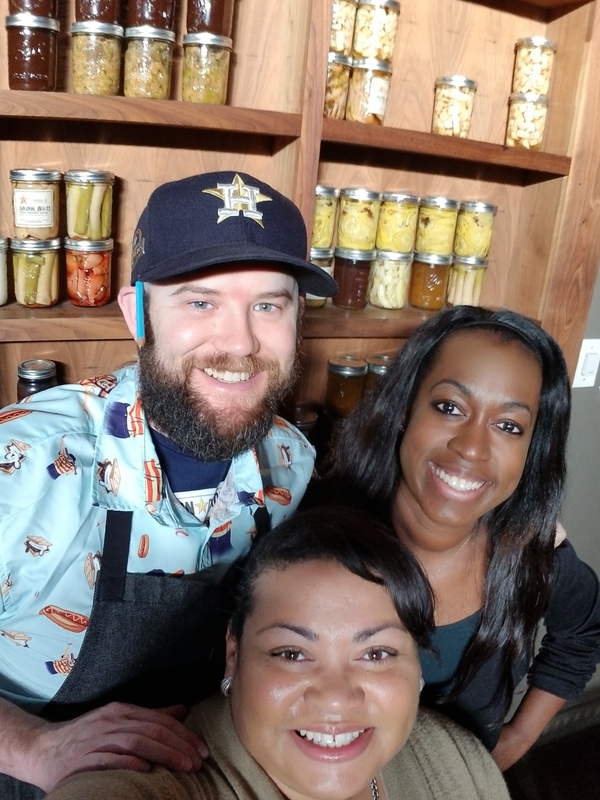 As we eagerly await the openings of UB Preserv and Georgia James, 2 Girls Who Travel had the opportunity to talk to Nick Fine, Underbelly Hospitality’s Culinary Director. So, what exactly does a culinary director do? Glad you asked. A culinary director is a blend of creative culinary arts and operations manager; someone who has a love for food and also understands the importance of the company, customer and employee. Nick Fine masterfully marries these worlds. Check out our interview with Fine below! 2GWT: Did you always want to be a chef? NF: I was a late bloomer to the chef world. Well, I was somewhat early. I went to school at Texas Tech and I wanted to be a park ranger. I was going to be Ranger Fine. I loved animals. Thought I was going to live in the outdoors. When I was a sophomore in college, I went and moved to Yellowstone National Park. NF: Oh yeah and they laughed at me. They were like ‘You need your degree!’ I was on summer break and they put me in the kitchen and I was washing dishes and one of our cooks had to leave and they were like ‘does anyone know how to cook?’ and I was like ‘yeah sure I know how to cook.’ And so I started cooking and fell in love with it and went back to Texas Tech, to my parents’ greatest sadness, and dropped out of school and ended up going to culinary school and here we are years later. 2GWT: Where and how were you trained? NF: I went to Scottsdale Culinary Institute, which was a beginning. I think culinary school was a good foot in the door, but really the school of the kitchens is where you really need to learn if you really want to do this. Everybody has a chef. So Chris Shepherd is chef. He’s my boss. Growing up in the cooking world you always find your one mentor. My mentor was a guy named Scott Bryan in New York City. He’s in a book called “Kitchen Confidential” by Anthony Bourdain. I worked for Scott for two years in New York. And that guy took this from a job I was just putzing around and doing and he made me consider this a career. It was the hardest two years in the kitchen I ever had. He was brutally honest. 2GWT (laughing): Did he make you cry? NF: Oh, I cried on a daily basis, but it made me really respect food, every single aspect of it… All that started with a guy that really drove that into his cooks. And then going through my career, I’ve only worked for people that I have respected… the food industry is so cool. It’s like no other that I’ve ever seen. It’s a community. It’s really small. 2GWT: Tell us what your role is as culinary director of hospitality. NF: It’s ever evolving day to day. It’s making sure most importantly that the restaurants are running properly, and the cooks and chefs are happy. That’s my main goal, making sure our staff is taken care of, because our staff does the day-to-day operations of making sure our guests are happy. That’s the most important thing that our guests are taken care of… I really do believe that is a really, really poignant point – making sure your staff is taken care of is super important. 2GWT: What excited you most about the concept of One Fifth? NF: It’s amazing to keep cooks excited and One Fifth does that in a whole different way. At One Fifth, we literally close the restaurant and for a month, we come up with a brand-new restaurant. I thought it was going to kind of be like smoke and mirrors and we were going to close the steakhouse and it was going to be basically the same thing. But it is 100 percent a different restaurant. It has a different feel, a different clientele, we have a different service style. What’s exciting is we are really opening five restaurants in five years. And it’s amazing. It’s so great and so awesome and so dumb all wrapped up into one. I think cooks usually hang out for about a year and then they’re like, ‘ok I’m ready to learn something new.’ This is an amazing concept, because we’re going to strip it down to the studs and start all over again. The food is important, but what’s really important and amazing about this industry is your personal relationship with your staff. Chris has built his restaurants on how he treats people. One Fifth was an idea of how do we take this concept and be able to build great cooks? And that’s what exciting about our concept. It’s really an extension of what Underbelly is: to be able to explore some different cuisines – for (Chris), for me and for the cooks. 2GWT: You have to be very comfortable with change in the restaurant business, especially with the concept of One Fifth. How excited are you for UB Preserv and Georgia James? NF: So Georgia James is going to be our steakhouse. We took One Fifth Steak and spun that… and then UB Preserv is preserving UnderBelly and putting it just down the road. So those are the two concepts that are happening. Couldn’t be more excited because this restaurant is (Chris’) dream. But when you get to the point where Chris is, and you have a certain amount of people that work for you, it becomes your responsibility to grow these guys or they have to leave. So For Chris to evolve, for me to evolve, for all of these great cooks to evolve, he either needs to send them on their way or he needs to grow. For us to be able to give some other people some opportunities is so important for us. It’s extending our culture to be able to allow more people. That’s what’s exciting for me. It’s so much more than opening a restaurant. It’s opening opportunities. 2GWT: What do you think of Houston’s food blogger scene? NF: It’s huge. It’s a way for a lot of people to share their experiences and give an honest opinion. I think blogging – as long as it’s informed and people are doing it the proper way by conducting interviews, talking to people and going to eat – is great. Chris tells me don’t read Yelp reviews. It will drive you crazy. But I do. And a lot of times, there are one-offs, but if you start to see trends, then you should take note. There’s value in every single thing that’s said about your restaurant. The biggest thing I would love to say to every Yelper and every person that blogs: think of what goes in to each dish and the time and energy. I promise you our goal, every single day, is to please every single person that steps into this restaurant. It’s so sad when somebody – for whatever reason – thinks we’re not here for them. People (at Underbelly) do feel like family. Yes, we make mistakes. But our intention at every single point is to make everybody happy. 2GWT: Is there anything you won’t eat? NF: I’ll try anything. Chris had these fermented black eggs. They’re essentially rotten black eggs. I wasn’t sure at first, but I said I would try them. He made a dish out of them and they were amazing. That’s a perfect example. If I had been somewhere else, and I wasn’t with Chris, I probably wouldn’t have tried it. 2GWT: What’s your favorite dish to cook? NF: It’s day-to-day. One Fifth Steak was a great thing for us. That was our first concept – because really, when I’m on a day off, I’m at the house and the easiest thing for us as cooks to do is to grab a cast iron pan and throw on a piece of meat and drink a beer and you’re done and it’s great. It’s ingredient-driven. If you can source a great thing and you have great technique it’s easy and it’s delicious. When I’m at home, I cook really simply, but in restaurants it’s all about good ingredients and it’s technique-driven. 2GWT: Will you tell us a best kept secret for shopping local, farm to table? NF: Farmers markets are easy and they are not intimidating. It should be fun. The new secret is that the new Canino’s Market is going to be freaking amazing. It’s going to be awesome. We’re doing some stuff with Canino’s Market – the old market on Airline that has been there for years. I think it’s going to be a huge secret. 2GWT: When you’re not running restaurants, what are you doing in your spare time? NF: Baseball and babies! I have a 13-month-old baby girl. And then I’m the biggest baseball fan. TGWT: If you weren’t a chef, what would you be doing today? NF: I’d be a bullpen baseball pitcher for the Houston Astros. I’m horrible, but I think I would be really good at it, because I could sit in the dugout and talk trash and make jokes the whole time. And I’m only doing it for the Astros!